When Lady Lydia Thornton is blackmailed over the shocking contents of a manuscript she once wrote, she must go to the most desperate of measures to raise the money to buy back the ill-considered prose: agreeing to an old wager posed by the arrogant, dangerous Duke of Penthurst. At least Penthurst is a man she wouldn’t mind fleecing—and she’s confident she’ll win. Penthurst long ago concluded Lydia was a woman in search of ruinous adventure, but even he is surprised when she arrives at his house ready to bet her innocence against his ten thousand pounds—a wager he only proposed to warn her off gambling. When she loses to a simple draw of the cards, Lydia is shocked. Now, her problems are twofold: a blackmailer determined to see her pay and a duke determined to tame her rebellious ways. One misstep and Lydia could find herself ruined—or bound to the seductive man who would make her his duchess. 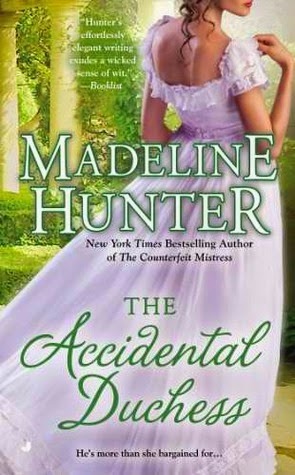 I liked the book for the most part, however I was expecting more of a romance than the mystery that is involved. When I picked this book up I was expecting a romance, the cover suggests as much. The romance is on the back burner in relationship to this great mystery. The romance was forced in the beginning, but the mystery allowed the romance to become sweet when she actually fell for the Duke. The mystery was packed with action, intrigue, and deceit it allowed the reader to not be so conscious of the fact that the story was not strictly romance. All of the characters had many likeable qualities.